OK, so they won't really save any relationships, but the idea behind the Presence in Absence USB pendants is almost sweet. You keep digital scrapbooks on your pendants and then swap those instead of bodily fluids when you finally reunite. 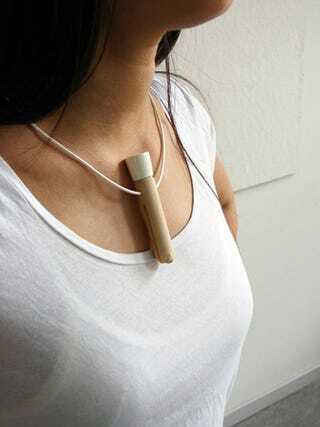 When you get your Presence in Absence kit, the two pendants are actually one single birch wood-encased gadget. You and your dear one are supposed to use the included carving knife to separate the two flash drives and bond while cleaning up the wood shavings. This process and the future data sharing represents how the two of your are parts of a whole and belong together. You'll share pictures, videos, music, the events in each other's lives that you miss out on during times apart.